you are invited to join the next meeting of the German OR Society (GOR) working group on Forecasting Methods. 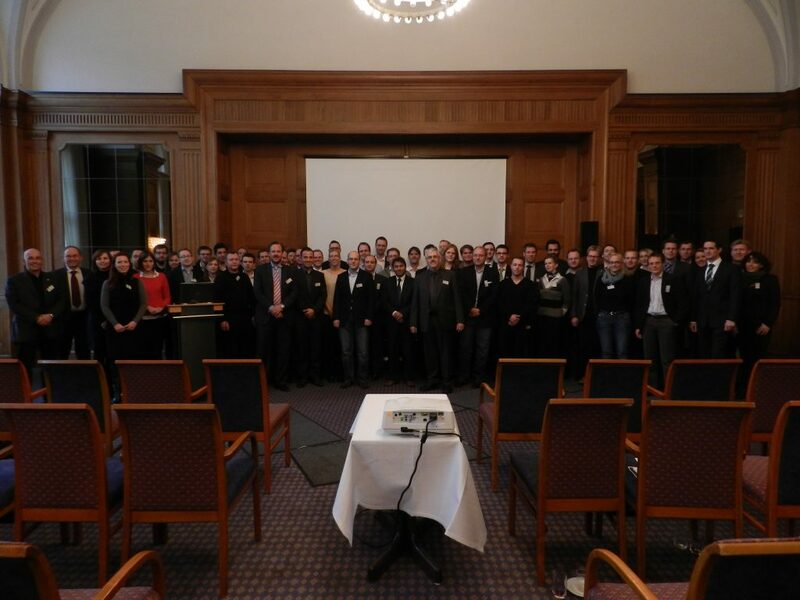 The meeting will be held December 5th & 6th 2013, and is hosted by the Bayer AG in Leverkusen, Germany. Due to the international background of the speakers, the meeting will be held in English. Registration deadline is 15th November 2013. The number of attendees is limited. Registration is free for members of the German OR Society (application forms can be found online: www.gor-ev.de), workshop presenters and employees of the hosting organisation only. Registration for all others costs €100.- (academic institutions) or €200.- (company representatives). Payment details are provided upon registration. We look forward to welcoming you in Leverkusen. If you are interested in the presentations, please contact Prof. Dr. Ulrich Küsters (ulrich.kuesters@ku.de). The presentation is mainly targeted to describe the challenges in improving forecasting quality and supply chain planning under uncertainty. An overview of our approaches in dealing with uncertainty by improving forecasting process & quality, inventory target setting and a decision support for S&OP will be described by highlighting the achievements and challenges for future. The presentation „Sales Forecasting at Bayer Health Care” gives a very brief introduction about the idea and objectives of the sales and operations planning process at Bayer Health Care. In the monthly process the communication and interaction between the different stakeholders are the key factors. The sales forecast as one outcome of the S&OP process is also supported by the statistical forecasting functionality within SAP-SCM. The statistical forecast can be used as a reference value or even as a proposal for the sales forecast in monthly buckets. Some details about the monthly statistical forecast generation are illustrated and explained. The presentation starts with an overview of the sales & demand planning process at Bayer CropScience (BCS). Forecasting challenges are depicted, e.g. for typical crop protection products which sell only during the beginning of the growing season. Instead of statistical forecasting, BCS decided to implement a bottom-up forecasting process. This new approach enables planners to create manual forecasts based on their knowledge of customers and local markets, the objective being to capture the unconstrained market demand. S&OP is a business steering process but also buzzword frequently used in recent days. How Beiersdorf, global skin care company and owner of brands like Nivea, Eucerin and La Prairie has tackled topic of S&OP? Presentation gives background and motivation for developing Integrating Sales Forecasting, foundation for solid and sustainable S&OP, which consists of description of roles and responsibilities and sweet spot of people, processes and tools for forecasting. It provides also methods applied during implementation to measure success and keep applicability on high level. In S&OP part, which is just under roll-out at Beiersdorf, there is information about structures, timings and gap analysis performed during collaborative process. The cost trends of the individual components in the electric drive train are a central aspect of the future market success of the different vehicle drive systems. An innovative two-factor experience curve approach was developed to facilitate the generation of the most meaningful cost forecasts for these components. The new approach “distributes” the observed cost degression over two columns, namely the “cumulative production volume” and the “cumulative patent publications”. Accordingly, the respective experience curves estimated using regression analysis fit more accurately with the empirical data than the common one-factor experience curve. In addition, the two-factor approach allows for the calculation of far more realistic learning rates. The performance of the model was demonstrated using alternative drive components, namely the proton exchange membrane (PEM) fuel cell stack, a high energy lithium-ion battery and a high power lithium-ion battery. Find out why leading companies and universities worldwide are converting to use extended simulation. We will describe some of the innovations that allow rapidly solving even complex problems and how to use a powerful object-based modeling and integrated 3D animation system with patented process logic that allows you to customize objects and achieve unprecedented flexibility without the need of writing Java or proprietary user code (but also possible). We also show how to extend simulation capabilities into daily operational support to reduce risk and costs by analyzing schedules in ways never before possible. Explore the academic grants and on-line resources that let faculty and students use and learn this at no cost. Accurate sales forecasts are a prerequisite for production planning and lay base for managerial actions and performance evaluation. The talk reports on research to evaluate accuracy over a fifteen year time span and to understand if accuracy increased. The results are somewhat sobering: learning effects did not occur, not overall and not for subsequent product life cycles. That is surprising given a large, successful firm with lots of experience. Plausible explanations are based on pronounced uncertainty and volatility of markets which do not allow for high accuracy. Typical instruments like yearly budgeting as well as some accounting rules seem to underestimate uncertainty. Given the degree of uncertainty the talk advocates to use simple decision rules and heuristics instead of complex forecasting methods. Today, potentials to improve market position can primarily be achieved by improvements of cross-company processes. In this context a companies‘ supply chain is gaining more influence to flexibly and expeditiously react on customer requirements. Quite often this is blocked by low knowledge about future demands and improper usage of relevant information for demand planning. Within this scope the lecture gives an impression how the effective combination of mathematical forecasting procedures and experts knowledge will lead to improved forecasting results. The approach has been realized as a practical software package and the author provides an insight into the architecture as well into the statistical proceedings employed. Beyond that the necessary processes and the User-interface will be discussed. Most companies now use sophisticated software such as SAP-APO DP that enables users to generate hundreds or thousands of forecasts quickly. For some products, the statistical forecast may be the best, but for others, human judgment wins out. Learn when judgment can help or hurt the forecast, what type of statistical models to use depending on the nature of the business, and what additional tools you can use for support in ABC-XYZ analysis and statistical model selection. Airline Business has very specific requirements towards a fully automized passenger forecasting system. Organizational setup and major workflows aim to achieve a high forecast accuracy. Special Event handling is one of these workflows. Critical question is how an automized forecasting system based on exponential smoothing may reliably predict with high accuracy in a volatile environment. The reliability day-ahead or long-term forecasts affects the profitability of utility companies. Meanwhile, there are established ways to produce reliable day-ahead forecasts. However, the German “Energiewende” with weather-dependent production mostly in the north of the country and remotely from large industrial customers in the south creates new demand for short term intraday forecasts of industrial customers, utilities and grid operators. This presentation explore the changing framework conditions in the German energy market, shows the consequences of adherence to traditional methods and introduces a new forecasting approach in adaptation to the conditions of the transition.